Sequins and rhinestuds adorn embroidered flowers highlighted with metallic threads. Feeling festive? Wear this for a pop of color and sparkle. The top is pretty and not a see-through white but, sadly, its also short, boxy, scratchy and over priced. Going back. I have about 12 sweat shirts from DG2, all fit just wonderful, I am a smaller XL, so XL is always a full generous fit. Not this time I ordered all colors, this sweat shirt is very tight/restrictive across the bust. I have found if I go to 1X the fit is just not there. I have to return all 4 items. For sanity sake get the sizing unified. I have lost 10 lbs so it should have been more than generous. Bell sleeves look extra fab adorned with an embroidered motif, while the split adds movement to the silhouette. 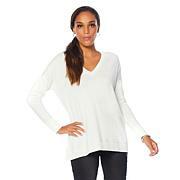 Rendered in soft French terry knit, this top plays nicely with denim and leggings. Cute and comfortable, perfect for casual days when you want to look your best. Combine easy style with chic details when you pull on this roomy number. 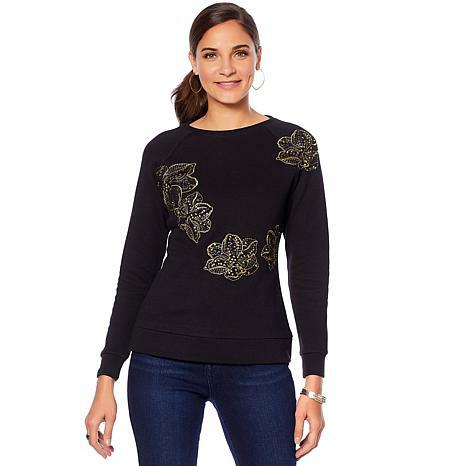 A twist on your everyday sweatshirt, it features on-trend bell sleeves and an embroidered design, making it equally perfect for running errands or running to a dinner party.